A spray cleaner is a great choice for quick and easy shine action. The Black Diamond Wood & Laminate Floor Cleaner is one of the highest rated cleaners on Amazon and is incredibly easy to use. It comes pre-mixed and requires no rinsing—simply spray and wipe away. It’s streak-free and formulated specifically for laminate (and hardwood flooring) to cut through tough stains and fight future debris from attaching to the floor. Once you spray either as a spot treatment or across the whole floor, use a microfiber rag or mop to wipe the non-toxic solution away. It’s safe for pets and children and leaves behind a subtle clean scent that won’t overpower your room. Reviewers rave that Black Diamond works better than any other competing product, and with over 1,000 positive reviews it’s clearly a fan favorite. If you’re looking for a cleaner for a larger area, a pre-mixed mop solution is a great idea. The ZEP Hardwood and Laminate Cleaner so many devotees you might start to wonder if it’s possible to love a floor cleaner this much. This 128-ounce jug works well with either sponge or microfiber mops and cleans baseboards, cabinets and molding as effectively as it does floors. It removes dirt and leaves behind a shiny non-sticky surface to make your floors look as good as new again. Some reviewers note that it can leave behind streaks, but it’s easily remedied by using less product and buffing with a towel after mopping. The best part is the ZEP cleaner doesn’t need to be rinsed away—just mop and go. If you’re dealing with heavily scratched laminate, check out the Rejuvenate All Floors Restorer. It works for all floors (not just laminate) and does a fantastic job of quickly buffing out imperfections. Rejuvenate dries in just 45 minutes and not only removes scratches but adds a protective layer to block UV rays that cause fading on your floors. It also adds about 50% more traction to your hard flooring, making it safer for kids and pets who love to run a little too fast indoors. If you love the just-cleaned-look of super shiny floors, the Quick Shine Multi-Surface Floor Finish and Polish is for you. This 64-ounce bottle is formulated for all types of floors but works extremely well on formerly shiny laminate. This ready-to-use formula goes on best with a fiber cloth mop: Simply squirt it across the flooring and wipe up. One or two coats is all you need to add impressive shine to your flooring that lasts up to three months. Reviewers say with a little elbow grease and the right amount of buffing, Quick Shine Multi-Surface Floor Finish can restore laminate to its just-installed beauty. We also give it bonus points for being made in the USA. There are many reasons to use organic, natural cleaning products in your home, and they can be healthier for children and those with allergies or asthma. The Better Life Natural Plant Based Best Hardwood Floor Cleaner is a great option if you want to keep your laminate looking good without the harsh chemicals found in other products. At a reasonable price, you get two bottles of 32-ounce solution made from all-natural ingredients. The product is safe for laminate, hardwood and more, and is free of VOCs, alkylphenol surfactants and petroleum chemicals. Like the other solutions on our list, it requires no rinsing and smells of fresh citrus and mint. Reviewers say Better Life products work as well as their competitors—just without the chemicals. Fun fact: It was even featured on “Shark Tank”, which instantly boosted its popularity. 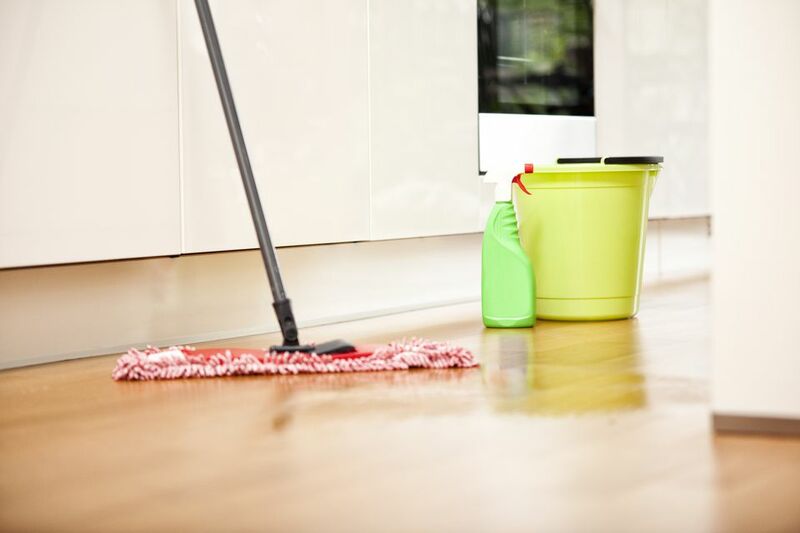 Bona cleaner has an impressive fanbase (for a cleaning product) and has become one of the most recognized names in laminate cleaning supplies. If you are looking for a one-stop shop that includes everything you need to restore and protect your laminate, the Bona Stone, Tile & Laminate Floor Care System guarantees you won’t need to buy any additional supplies. Each four-piece set comes with a mop handle and a 4” x 15” mop head, a Microfiber dusting pad, a cleaning pad and a 32-ounce bottle of Bona Cleaner. Bona solution is easy to apply, non-toxic and requires no rinsing. The supplied mop and dusting pad make it simple to swipe on and avoid streaking. The Bona Stone, Tile & Laminate Floor Cleaner Spray is formulated to cut through tough grime and dirt, so it’s a great choice if you’ve neglected your floors a few too many months. When you have a pet, accidents are bound to happen. If your furry friend tends to have those accidents on your laminate, Folex Deodorizing Hardwood Floor Cleaner effectively works to diminish urine and other pet odors from your floor. It’s safe to use around pets and children and removes dirt and grime while attacking odors with a fresh almond scent. Each bottle has 32-ounces of product, requires no rinsing and works best with a buffing mop or cloth. Reviewers love Folex because it leaves behind a slightly longer-lasting scent than some of its competitors, which is great if you’re combating smelly pet odors.